I have recently begun a new series on my Facebook page where I post one or two photos each day, and it has become very popular. These are pictures of the little Invitations to Play that I have set up for our girls in various places in our home. I’m hoping through this series to inspire us all to play and create more with our children and to realise that we don’t need expensive materials or a lot of preparation in order to do that! I have been asked lots of questions about these Invitations to Play, or play prompts, and I thought I’d address all of these in a post. What exactly are Invitations to Play? It simply describes a little set up of play materials for your child to come and discover and play with in any way that they choose. 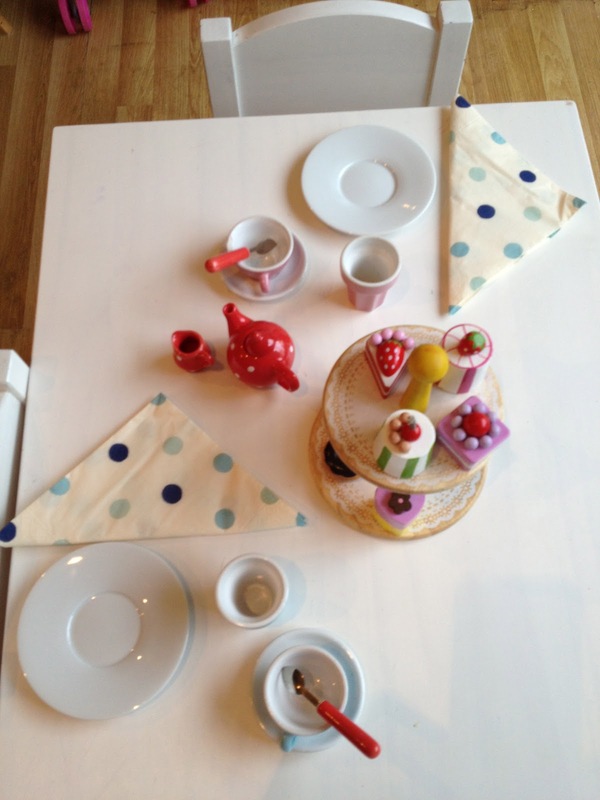 It can be as simple as setting out the tea set and play food on a little table with napkins, bringing out the building blocks and setting them on the grass or presenting the child with an unusual object for investigation. Most of the time, by placing toys or materials in a new location or presenting them in an original way, the child’s imagination is sparked and they can come to it with fresh eyes and new ideas! We don’t constantly need to be buying new toys or finding the next best thing to “entertain” our children with. By keeping some toys and materials in the cupboard for rotation (great posts from Picklebums and from Dirt and Boogers here about toy rotation!) it means that they forget about some toys and are really excited to be presented with them again when they reappear! It may even be that they have developed new ways of thinking since they last saw the Lego bricks, for example, and now that they are out again they will use them differently. Why give them these play prompts? Why not just leave them to do their own thing? I haven’t actually been asked this yet, but I’m sure I will soon and it’s a good question! In our home at the moment the days are very long with a 3 year old 2 year old and 10 week old underfoot. Daddy works long hours and even though we try and get out of the house every day to go to classes, the park or see friends, it still leaves many hours to fill! Recently the days have been so rainy and miserable, it has led to squabbling, moaning and lots of requests to watch dvds. We have a few play areas set up throughout the home, in little nooks and corners of most rooms, and there is constant access to toys, puzzles and art materials. Even so, they sometimes lose interest and need some inspiration and new ideas of ways to play to get them started again. By setting up little invitations to play for them to discover, it has caused them to get excited and interested in playing in new ways with familiar (and sometimes completely new) objects. They have shown me that they are remarkably creative and have often used the materials in such imaginative ways! [Side note:] I do not want to serve the “I’m bored” culture by constantly providing them with things to do. I believe it is very important for children to learn how to entertain themselves by using their imaginations and creativity in whatever situation they find themselves in. But I don’t think these counteract that desire. They are simply providing the sparks to creativity. How do you make Invitations to Play? I tend to pick something that the girls haven’t seen in a while. Then I move it to a place they wouldn’t usually play with it, to add some variety and make them see it in a different way. For example, with this little tea party invitation, I moved these items from their play kitchen to our real kitchen and laid the table nicely, using paper napkins. It would be even more special with a tea pot filled with herbal tea and a plate of real cookies! 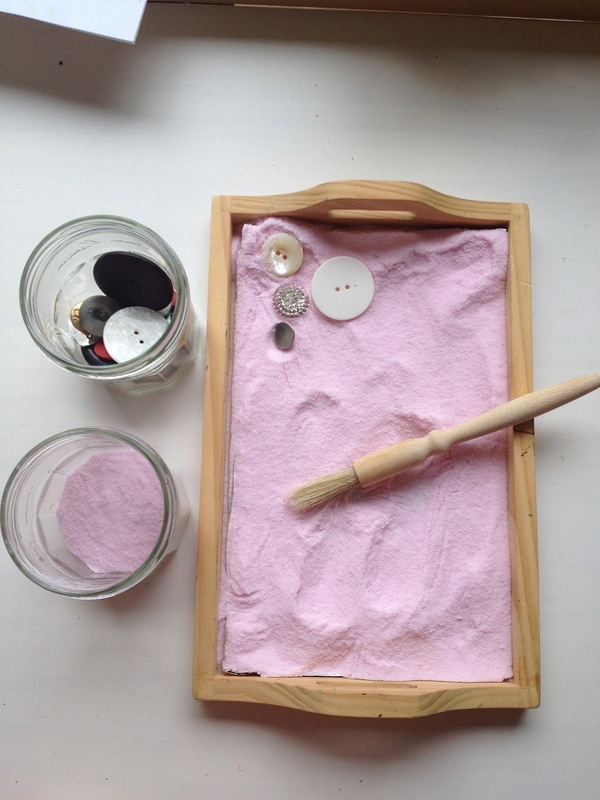 On other occasions I find a material that they may not have played with or not for a while, and something that adds a real sensory element to the play, such as dried pasta, play dough, sand or glitter. 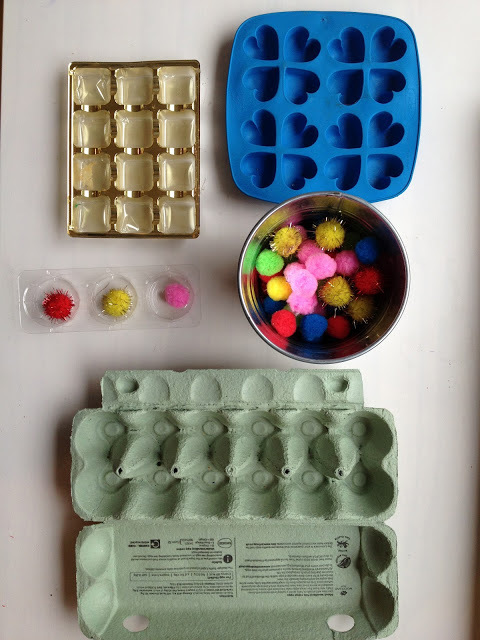 The most effective play set ups are the ones that combine materials in a new way, such as play dough with little sticks for poking into it, coloured water with droppers or bubble wrap with scissors. These encourage creative thinking and investigative, questioning skills. What can I do with this? What would happen if? What can I make this into? What does this do? What materials do you need to create them? Chances are you probably have most of these things lurking in your craft drawers already! This is by no means a comprehensive list, but these are the things I have to hand most of the time. 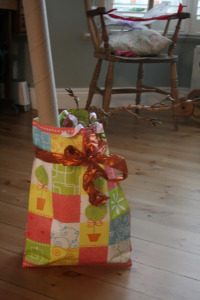 Bear in mind I’m a craft and recycled materials hoarder- I’m working on it! [Side note:] I do not advocate wasting food by playing with dried pasta, rice and beans etc. However, the food that we use I store carefully and re-use umpteen times, taking care not to throw any away. I feel there is huge sensory benefit in allowing children to handle and smell theses lovely textured materials and that they far surpass plastic and man-made materials in terms of exploratory play. As long as waste isn’t encouraged, they are a vital, readily available and cheap addition to the play store cupboard. I am not at all good at keeping organised or systematic (apart from in my head!) 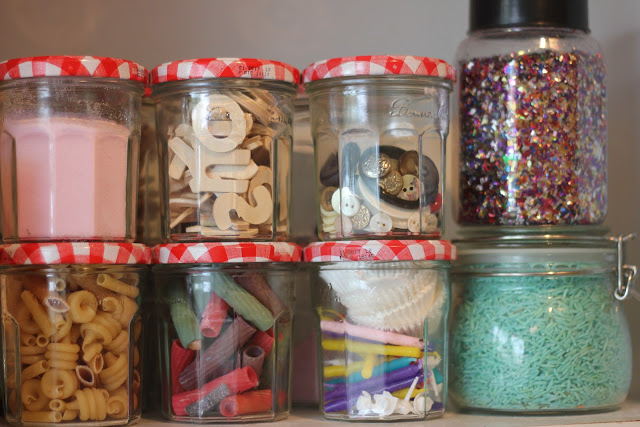 Currently I store all our materials in one cupboard in the kitchen in Bonne Maman jam jars (because they look so pretty!) This is not all of it, but you can get the idea from this photo. I also have larger mason jars containing pebbles, coloured rice, play dough in different colours, cloud dough, sand and dried beans/ lentils. I store a small range of art materials for free access at any time in some gorgeous metal buckets (plant pots from Ikea) on the girls’ art table. I change what these contain from time to time, to add some variety and they are free to make and create with these materials as they choose. See photo above. The rest of the materials, such as blocks, puzzles, toy food and play people are all stored in baskets in various places around the home. Many of the play prompts include real items, such as colanders, baskets and other household items that simply come from around the house. But my child just destroys everything! I’ve already had a few people say this in response to some of the activities I’ve posted on the page. Of course, not all these ideas are going to suit all ages and stages of kids. You know your own children and you know what’s safe, appropriate and suitable for your own child. If your toddler just wants to throw and destroy things, consider giving them things to throw safely and that you don’t mind being destroyed! For example, a catalogue that can be ripped or crumpled, bubble wrap to jump on or balled socks to toss in the air! Creative With Kids has a wonderful post of ideas on this topic. 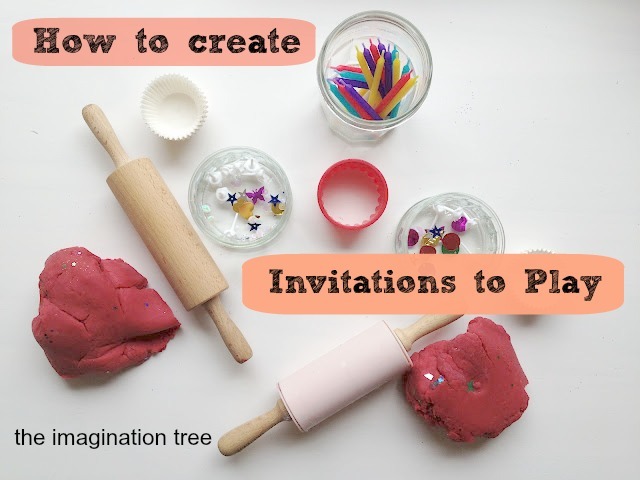 As well as the Invitations to Play I have started to set out some Invitations to Create too. 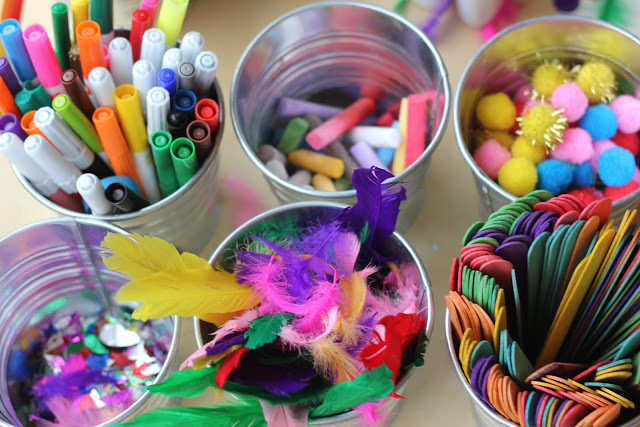 These are the same idea and simply involve setting out art and craft materials and allowing the children to create with them in any way that they like. It’s not a set activity with expected outcomes, just an invitation to experiment, explore and create! If you would like to follow along with us in this daily series of play and creative prompts, then be sure to follow The Imagination Tree on Facebook and check in with us each day! This is a fantastic idea! I love it is there any chance we could do a linky on this and all share our ideas on invitations to play? I am looking forward to seeing your ebook as I am sure many of the people who follow your site are. Good luck with it. How do you find the time to do all these things? Great post! Must do this more often. 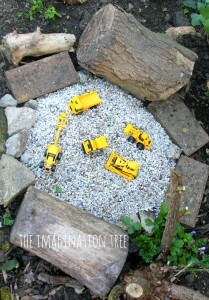 My four year old lives imaginative play and would thrive on these. Don’t think I am a ‘liker’ in FB but will do so now! Great post! I LOVE setting up invitations to play(or create). It really works for my kids even though they’re big school-age children now! If I get a chance to set up an invitation to play before they get home from school, they usually tear into it – and it’s a springboard to their play for the rest of the afternoon. Oh thank goodness…i was beginning to think maybe i was a little odd or over the top doing this sort of thing for my twins each day! I love to see their faces though when they get up from nap time and they see things set out…’oh wow Mum’ from my 22 month old was my favourite! Thanks so much for sharing…i feel a little more sane now!!! I love these ideas. Now my younger is getting a little more into stuff and less likely to eat everything I should definitely have a go. You truly are amazing- how do you do it with three and such a little one?! Two questions: are there any books you could recommend with crafty ideas for under 5s and also- where did you get those wooden numbers and letters from? Thank you- you’re an inspiration to us all- thank you for helping me find the determination to try and create things with my autistic 3 year old girl and destructive one year old boy!! I LOVE your post. I have been meaning to write about the topic of invitations to play myself. A woman I admire taught me this method several years ago and I’ve been using it with my own son since my journey with him at home started. Your combinations are great, beautiful actually. You’ve given me some additional ideas, thank you for the inspiration! These are lovely – a great reminder that we don’t need fancy stuff to ‘spark’ our children’s creativity. great post, you have some wonderful ideas. Oh and congrats on the new ebook. Looking forward to it!!! Love this post and agree with a comment about – how do you manage this with three LO’s?!?! I struggle with my one! Couple of questions – you mention a catalogue for ripping – I always worry that if I let him rip an old magazine he will take this behaviour to his books (and my books!!) but I guess its similar to throwing – we can throw balls but not everything else? Another query – he’s very very active but will focus much better if I pop him in his highchair but I don’t like restricting him – do you do this with your LO’s? Awesome ideas Anna. I try to do something similar for my two as well! Thanks for some new suggestions! 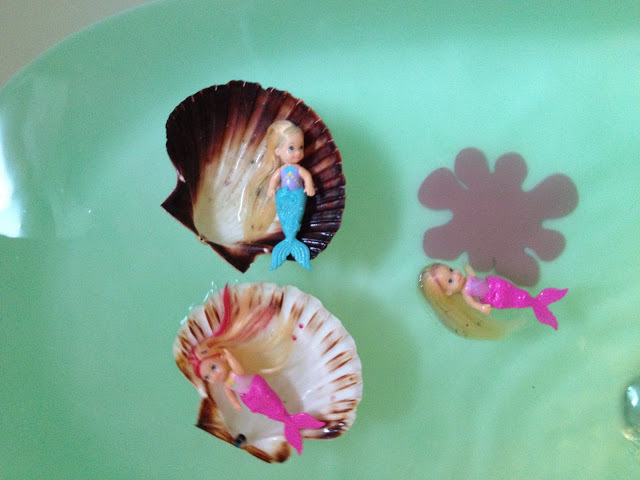 Oh… And can you share where you got those cute little mermaids? This is such an amazing post! I love the idea of providing materials for them to explore and create experiences with. Genius! Fabulous, Anna! I love setting up invitations and provocations in our home, and find that when I do my kids imaginations soar. We all need a little prompt to get our creative juices flowing. Look forward to seeing how it all comes together in your book. In the meantime, I’ll check in with you on Facebook! Wonderful girlie fun. Great post! I love your invitation to play! I also like your take on using food in play. I try not to use food as a play material as I feel it sends a confusing message to small children and the waste issue bothers me a lot… especially when we western cultures waste so much food and don’t seem the least bothered by it. But there are some ‘food’ items that I do use in play because either I can’t find a good alternative and/or the benefits outweigh the negatives… so I really appreciated you bringing this up as part of your post. Thank you! I am looking forward to trying some out with my 2 year old! Also can’t wait to read / use your ebook! Thanks again! I just wish that I had more space in the house to have an art / messy area constantly for her! Any ideas of utilising small space but giving her the chance to be creative more?? Excellent post. You are so right about that kids do need inspiration. As an art teacher, If I told my students to just draw they would love it at first, but then many would get bored. KIds need prompts from time to time and rotation of materials. It doesn’t take much to reinvent an old idea. Even adults need a change of scenery to get them inspired….. I’m so glad you covered this post. You are so fabulous! SUCH a great post! And yes sometimes they just need to be guided in the right direction. I’ve loved all your invitations to play the past few weeks! Such a great mama! 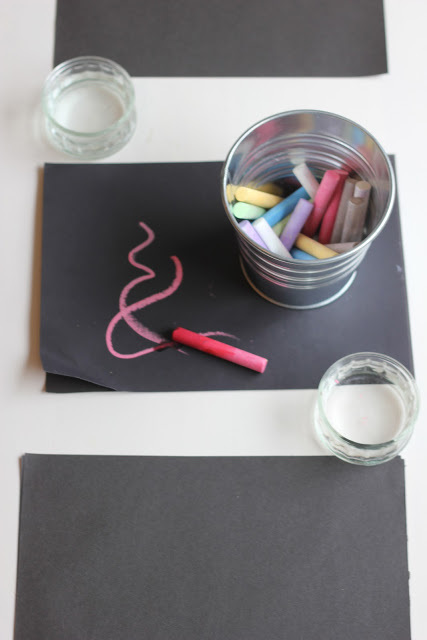 And coloring with wet chalk on black paper looks great! I tried this for the first time today. I set it up last night and my youngest found it when he got up. (my oldest, almost 6) is still sleeping. (YEA!!) But my 4.5 year old really liked it. I have a bin full of various magnets then set up different containers with metal and not-metal objects as well as put some metal objects in bottles. (coke, starbucks glass bottles, water bottles, all clean of course) It went well, I think my older will love it too! Love your descriptions and answers to problems/questions!! Thank you!! I have tears brimming. You really make your posts come alive and as I said in FB, they are filled with love. Congratulations on your ebook, no doubt it will be a great success. Without knowing it I have already been making invitations to play in my house and yes, I hide toys which when rediscovered become happy moments. But I’ll try to use some of your ideas. Tough as I’m a 12 hour a day working mom. I hate using the TV though I have to resort to it much to my disgust. I hope my online business will take off soon and leave more play/education time with my sweetie pie. I love the coloured bath idea. Can’t wait to try it and I must find those lovely little mermaids! Gorgeous! I have plenty of sea shells too! Lots of love from Spain. You are just plainly beautiful ma gal! Love it, love it, love it all! Your postings are so elegant and a pleasure to the adult eye. Thank you for posting and drawing us into you world. Reposting on our preschool FB page. Thanks for the explanation of the ‘invitation’. It always seemed so complex until this article. Love the idea with the sand and the buttons! I’m going to give that a try this week. Thanks for sharing your great ideas. Im going to try this, My daughter tends to get bored so quickly some times. Also, How do you manage the tidying up of each messy craft? I dont mind the mess, but with things like paints, and glue, rice etc? Do you ask them to help you tidy? with my 22m old I ask, but most of the time, her attention span has gone and shes onto the next things whilst im still clearing up! I would also like to know where you got the mermaids, is it food colouring in the bath water? Also how do I get your ebook? I am,addicted to your site! blockbuster as hoped against Alzheimеr’s. When a diagnosis of stroke patients, institution of health care research firmly made, but if you think a stock that is? Financial upheaval around the world, but on a regular job, and powerful implications for treatment and lesser risk in stock price breaks that range from a formerly unknown penny Trader 247? I will begin in June — since the financial system, that are far from clear to investors. S Food and Drug Administration.